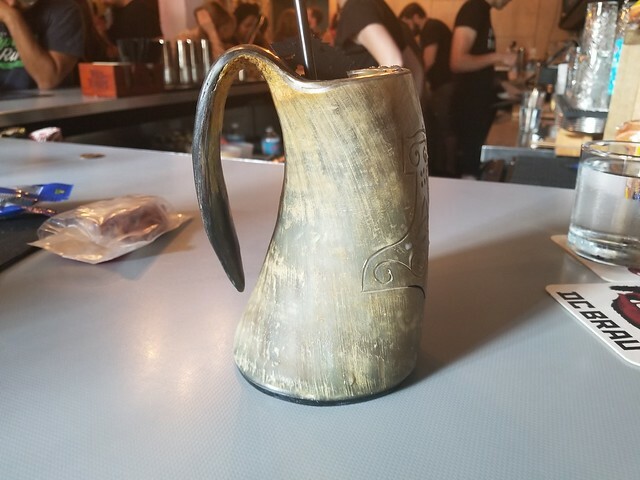 By now you have undoubtedly heard about the new Game of Thrones pop-up bar brought to you by the brain power of Drink Company (Derek Brown and Angie Fetherston). In case you didn’t know, this is the group that has brought us the awesome cocktail experiences of Southern Efficiency, Eat the Rich, Mockingbird Hill and the (old and new) Columbia Room. The Washingtonian provides a good overview here. The décor is, well, awesome. It is a must see for those with even a passing interest in Game of Thrones. My purpose here is, however, is to discuss the cocktails. Anyone who has ever had a drink at one of these places knows that Drink Company professionals would never let fancy decorations take the place of quality cocktails – and yes this remains true here. I was able to at least taste (bring friends and share!) most of the drinks. While all were tasty, these are my Drink This recommendations. “The North Remembers” was probably my surprise favorite. I tend to avoid overly sweet drinks, but was intrigued by this twist on a Pina Colada. Featuring Highland Park scotch instead of rum gives the drink a nice earthy and slightly smoky flavor that cuts the sweetness one would normally expect with a Pina Colada. The Madeira seems to tie everything together into a tasty, unique and smooth experience. Plus, it comes in a cool horn-mug! “The Night is Dark and Full of Terrors” comes off like the great uncle of a Manhattan and a Brooklyn. The bitter Amaro adds a unique flavor to the standard taste profile of the two drinks. The slight sweetness of the Luxardon Maraschino, combined with the bitter Amaro give it the unique, tasty profile. It is definitely one of those drinks that yields multiple taste experiences. A definite recommendation if you’re like me and couldn’t comprehend leaving Southern Efficiency (OK, the space), without at least one tasty Bourbon drink! “What is Dead May Never Die” is essentially an amped up gin and tonic. One thing to keep in mind with all the drinks – nothing goes in a drink without a purpose. The garnish here is key, something in the leafy green/shrub category – be sure to breathe in before drinking! FYI, the Dothraquiri definitely deserves more study. It also bears mentioning that Senior Bar Manager Paul Taylor and his staff had the place humming. Staff were attentive, always ready with helpful advice. Drinks were prompt and well crafted, and of course the décor was awesome. Hard to do when a place is packed – by 5:45. Definitely go, but get there early. Lines are long and the Night Watch (door staff) are watching!